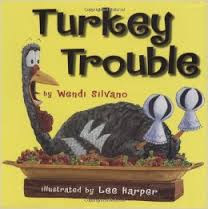 We read the book Turkey Trouble by Wendi Silvano. It is such a cute story! Then we talked about what we think a turkey should use as a disguise. I downloaded the free template and kit from The Fabulous Life of an Elementary Teacher. Click on the name to go right to her post about it. The turkey is just too cute! Each child was given the turkey template on white cardstock. They brought them back to school as soon as they were finished with them. We had lots of Bat Man turkeys and even a horse turkey. Love! !